Here is a capacious and sparkling gathering of poems, an anthology that extends its reach from the English-speaking world to Asia, Africa, Europe, and Latin America. This unique volume includes such well-known figures as Pablo Neruda, Anna Akhmatova, Paul Celan, Seamus Heaney, Wole Soyinka, and Elizabeth Bishop but also offers the less familiar but equally welcome voices of Ugandan Okot p'Bitek, Indian A.K. Ramanujan, and the Japanese poet Shuntaro Tanikawa. 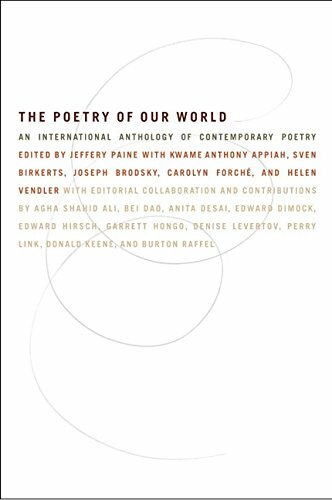 With insightful essays by such eminent scholars and poets as Helen Vendler, Kwame Anthony Appiah, Sven Birkerts, Carolyn Forché, and Bei Dao placing the selections from each region in their cultural, political, and literary contexts, The Poetry of Our World guides readers through the richest and most eclectic selection of world poetry available today.